Forbes, JUL 20, 2017 - Two months have passed since the May presidential “elections” in Iran that saw the incumbent Hassan Rouhani reach a second term. The pro-Iran appeasement camp in the West went the distance to raise hopes over the hoax of Rouhani rendering major reforms. These voices somehow described Rouhani as a “reformist” and completely neglected the over 3,000 executions during his first term as president. Reports from across the country are turning out to be very disturbing, signaling more troubling times to come in reference to human rights violations. This is Iran again resorting to old tactics of taking Westerners as hostage, mainly dual citizens, to be used as bargaining chips in advancing objectives and politics in negotiations with interlocutors. Another practice the regime in Tehran will continue is sending scores to the gallows.  The Iranian opposition National Council of Resistance of Iran issued a report recently indicating 57 individuals have been executed across Iran in the beginning of July alone. Reports from inside Iran also indicate nearly 120 inmates held in a prison west of Tehran are on the verge of execution. These hangings are planned for the next few weeks, their families say citing authorities, and the sentences of at least 13 individuals are to be implemented soon. These alarming reports have all arrived only after a recent tour launched by the mullahs for dozens of foreign ambassadors to visit the notorious Evin Prison located in the hilltops of northern Tehran. But of course, no human rights organization or international prison expert were invited, only selected areas of the prison were shown, and merely hand-picked images were provided to the media to depict a highly peaceful environment and go against any claims of rights violations. This PR show in Evin, with its history of atrocities, was coupled with Iranian state media outlets pumping reports claiming the jail being upgraded to state-of-the-art conditions. Iranian authorities went the distance to showcase specific facilities provided only to rich inmates behind bars for financial crimes. These areas included a gym, an in-house beauty salon, a library and also a restaurant. If Iran truly intends to be transparent, why not begin permitting all international human rights organizations unlimited access to any and all areas of each and every single prison across the country? Following this orchestrated tour, Human Rights Watch made a call to Tehran seeking access for rights groups to these prisons. HRW is among many similar entities seeking access to Evin as the facility has been closed to human rights investigators representing independent international and national organizations. While there is no expectation for Iran to begin allowing any honest visits, two female political prisoners wrote an open letter explaining the atrocities they endured in Evin. 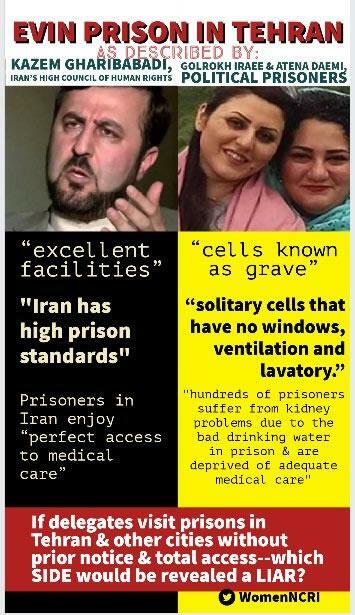 Political prisoners Golrokh Iraee and Atena Daemi described ”solitary cells with no windows, ventilation and lavatory,” “dungeons and dark interrogation rooms,” and “cells known as graves” in Evin. Why did this international delegation not visit the women’s ward of Evin where female political prisoners like themselves are held, they asked. Their letter goes on to explain how ward 4 of this prison was renovated by the inmates transferred to solitary confinement on the very day of the ambassadors’ visit. Mrs. Maryam Akbari Monfared, another political prisoner whose three brothers and sister were executed during the 1988 massacre of over 30,000 political prisoners across Iran, also wrote an extensive open letter as she spends her eighth year behind bars in Evin. Having experienced a variety of Iran’s jails for decades, Monfared wrote, “I’ve witnessed with my own eyes the devaluation of human and humanity” and experienced atrocities also in Shahre-Ray and Gohardasht prisons. “Prison food was so little that hungry inmates were forced to collect the residue of other food trays as well as the food which was left on the ground,” she explains. What needs reminding here is the fact this is a regime founded by the ultraconservative Ruhollah Khomeini who, as the first supreme leader of Iran, authorized the amputation of hands and feet as punishment for thieves. All this is more reason for the international community, and especially the Trump administration, to turn up the heat on Iran. The regime in Tehran is resorting to all measures possible to deceive Washington and other parties to delay the blacklisting of the Revolutionary Guards as a major party involved in the mullahs’ crimes against humanity, terrorism and international belligerence. In 2009 former US president Barack Obama betrayed universal humane values and chose to side with the mullahs’ regime. And Tehran responded by continuously taking Americans hostage and now putting a show for the Europeans and others. Taking strong action against Tehran, similar to the recent sanctions slapped against 18 entities involved with Iran’s support for terrorism and ballistic missile program, will finally signal to the Iranian people that the world has now decided to stand by their side.